Collarless Zip Suede Look Jacket is rated 4.5 out of 5 by 4. 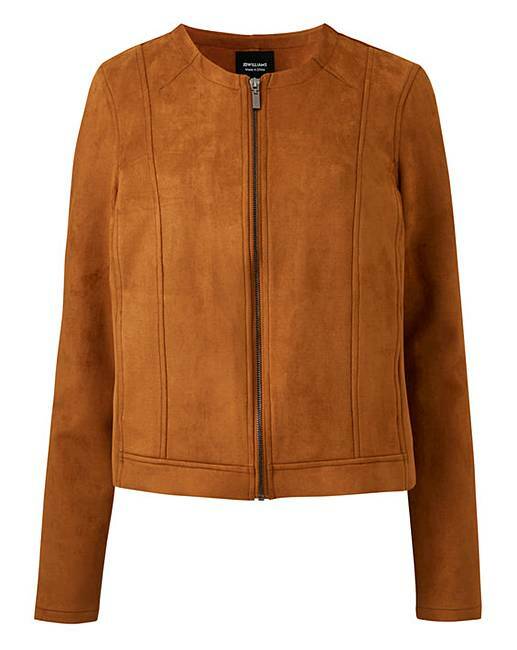 Retro meets modern chic with this Suede Look Collarless Jacker in Tan. A perfect transitional jacket which can easily be worn day or night, this Suede Look Outerwear piece is a fashion essential. With curved seams to the body to flatter your body's natural shape and a sophisticated, on-trend collarless neck this jacket will have you looking and feeling amazing. Pair with warm earthy tones for a modern take on a wardrobe classic. Outer Coating: Polyurethane, Base: Viscose. Rated 4 out of 5 by CJones from Nice find!! Nice little jacket comfortable and true to size. Compliments when wearing it. Rated 5 out of 5 by Donna from On trend must have I love this jacket it's so versatile. Good with jeans or dressed up for the evening. Excellent value too.